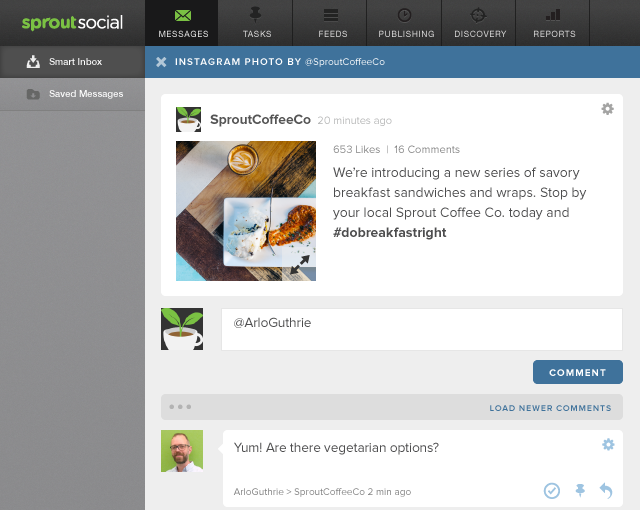 Sprout Social recently added Instagram to our supported social networks. This development helps our customers manage their social efforts more holistically—putting all their social media messages in one central place. Getting started is easy: Just connect any and all of your Instagram profiles, and give your colleagues permission to manage the account. Whether you’re a one-person show or part of a much bigger team, Sprout provides a professional approach to social media management, with a focus on engagement. While you are not able to publish media through Sprout right now—due to Instagram’s not providing this feature as part of its API—you are able to send messages and respond to comments that stream through Sprout’s Smart Inbox. Participate in meaningful, two-way communication by clicking on any comment or sent photo or video. The comment stream simplifies responding and/or tasking so you can efficiently work through incoming messages. You already use the Sent Messages Report for measuring success for Twitter and Facebook posts; now Sprout gives you the tools needed to analyze Instagram posts too. Sprout’s Sent Messages Report provides insights into which posts perform the best by tracking comments, likes and engagement rates. You also get context behind the data with thumbnail images and captions that accompany individual stats, so you don’t have to switch back and forth between Instagram and Sprout. Use the Sent Messages Report to find the true value of your Instagram posts, and set your strategy accordingly. Over the next several months, Sprout will continue to develop Instagram capabilities to meet our customers’ needs. One focus will be integration with our mobile app that includes commenting, tasking and sent message reporting. Another enhancement will be advanced reporting, which includes hashtag data and an Instagram profile report. 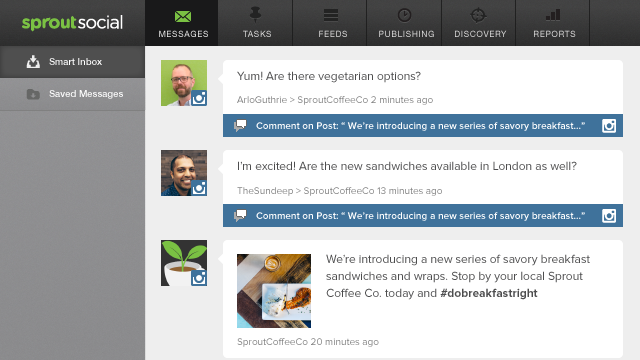 And, Sprout users will also have the ability to monitor their brand’s hashtags in the Smart Inbox. 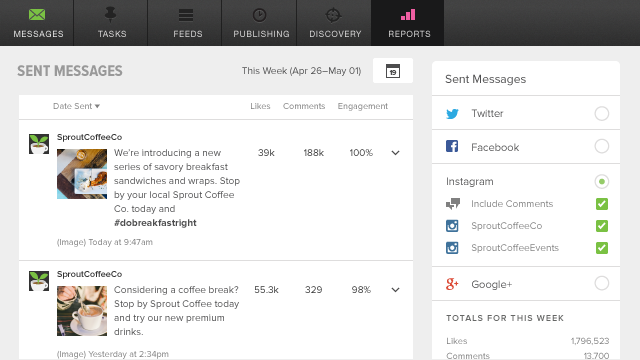 Learn more about Sprout’s Instagram management capabilities here. Stay tuned for more updates, and as always, let us know if you have any questions or feedback. Talia Gibson: Talia Gibson is the Director of Product Marketing at Sprout Social. She loves all things technology, travel, puppies, marketing and Stanford football. Follow her on Twitter @iamtals.